On her birthday Lisa took care of other people all day. She’s a cancer fighter but was able to take care of herself and everyone else at the same time. I say ‘cancer fighter’ instead of survivor because survivor makes you think of words like remission. The cancer Lisa fights is, so far, incurable and terminal. In March of 2010 she found out she had a type of non-Hodgkins, small cell lymphocytic lymphoma that still has mainstream oncologists baffled. The doctor said she should expect to start dying within 48 months. But she fought it, and with the help of prayers and an incredible enzyme therapy developed by Dr. Nick Gonzalez, she’s still fighting. Every day. I met Lisa on April 17, 1976 at approximately 11:55 am in a little pizza house in a little college town. The next day was our first ‘date’ and we’ve been together ever since. Her beauty inside and out is unchanged in all the years. Yesterday on her birthday she spent the day taking care of other people. Mostly, people from ‘my side’ of the family who are struggling right now. That’s just who she is and what she’s does. Lisa’s daily protocol requires her to be home most of the time. She takes over 200 pills around the clock daily, eats only organic food… I’ve made over half a million ounces (I’m not guessing, I did the math) of carrot juice for her every morning since March of 2010… and several other things that have altered her life style drastically, but in no way more than the fact that she’s very tied to the house. When we do travel it’s a major production of transporting cooking equipment, groceries, juicer, coffee maker; we basically move enough to supply a kitchen and bathroom for her routine. Consequently, we just don’t travel much if we can avoid it. Even going to the beach for a day is nearly impossible without spending a night, so she seldom wanders far from Peacock Lane. We hit some milestones last year. We had our 40th wedding anniversary and a couple of other big events. But it took me months to set up the real celebration. I booked a cabin on the north rim of the Grand Canyon and then rented an RV out of Phoenix. 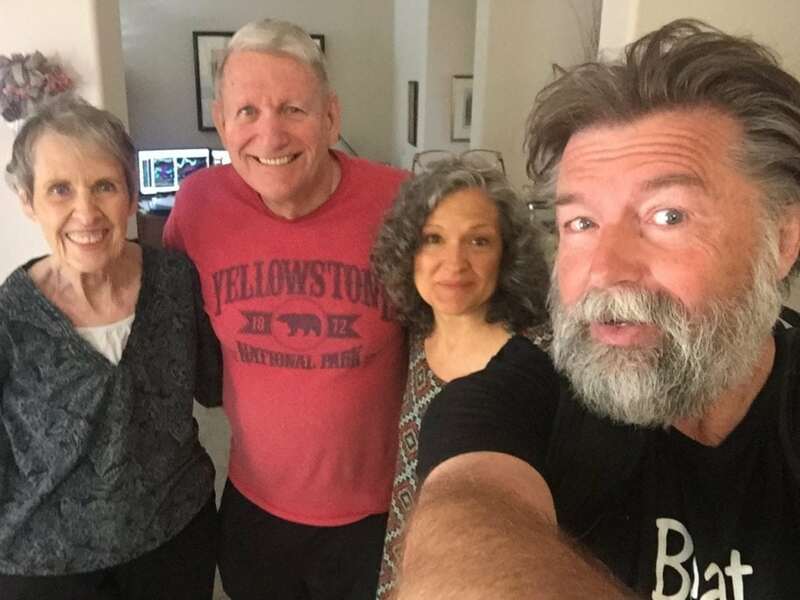 That allowed us to visit two of our best, all time ‘friends for life’, Al and Gloria Baird. Gloria fought a good fight, too, and, as some of us who’ve been in the ministry all of our lives say in times like these, she “transferred to the home office” just last week. That Lisa and I were allowed to spend three nights at their house just a few weeks ago is a sweet kiss from God. I can’t find the words to say all I’m feeling about that. I love you, Gloria Baird! You always were and are and will be a true spirit of love, joy, peace, patience, kindness, goodness, gentleness, faithfulness, godliness…self control… you are a light! And Al is stronger than steel with a heart softer than a pillow that many hurting people, including me, have rested on for years. Thanks for you hospitality even when you were getting ready to take the biggest trip ever. 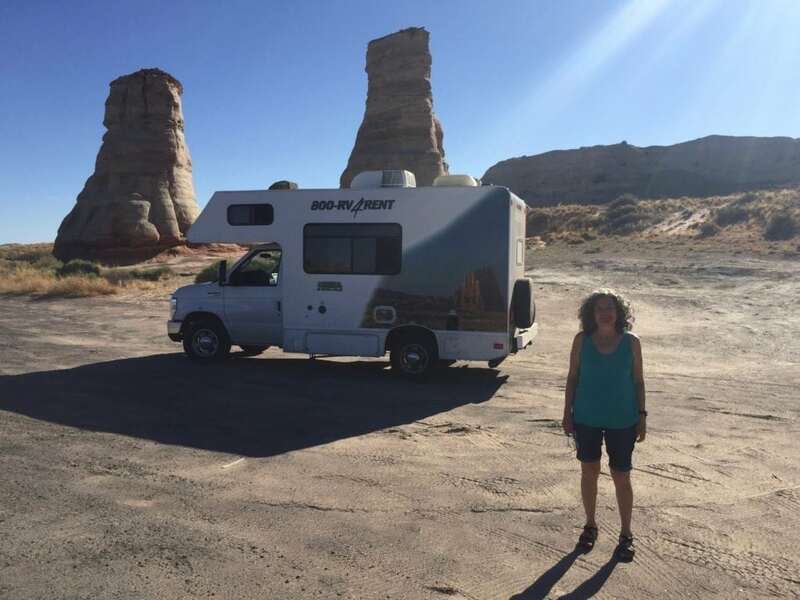 Lisa and I left the Baird’s house to take the first RV trip of our lives. I’ll spare the details for now but let me say, it was the most fun I’ve had in 30 years. I love my children. My oldest is 29. Again let me say, the RV alone with Lisa on the road and together all day and all night for 5 days was the most fun I’ve had in 30 years. We were, well, ‘us’ again. Just the two of us, laughing, cooking in the desert and in the mountains and in the canyons; spending almost every second together. … but we didn’t need another inch to find happiness. I was very sad to return our home on wheels. When we got back to Portland I went to the local CruiseAmerica just to see if there was a used one for sale. It’s more complicated than that, apparently these little 19 foot suckers are a hot item. But they had one on the lot and I asked if I could just have a look inside. I went inside the RV, which was identical to the one where Lisa and I had laughed, cooked, talked for hours and see amazing, glorious sights together… and… I began to cry. I don’t mean my eyes watered. I started crying just short of sobbing. I was drowning in my tears and the realization that I didn’t miss the RV; I missed ‘us’. The the two people who’d fallen in love and wanted to see everything through each other’s eyes forever. The two people who’d had children and loved them desperately, but had evolved into a different kind of couple than what they were 30 years ago. I missed the two friends we were cut loose from Peacock Lane and rolling free on the road. 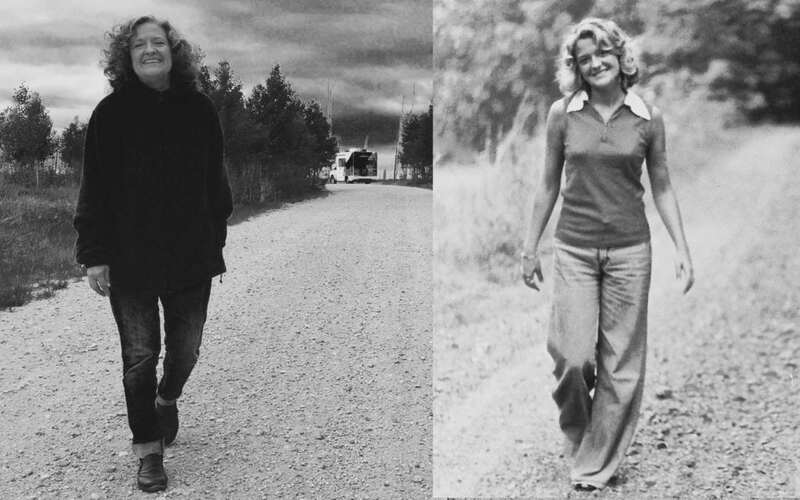 Now all I want to do is find a way to stay on that road with her. God has bounded you two together, Steve Johnson and Lisa Johnson, in complete love and He seems to want you to be completely happy and content! So let there be more RV trips! !